Follow the instructions below to install, configure and learn how to create custom exports for your new product. B. 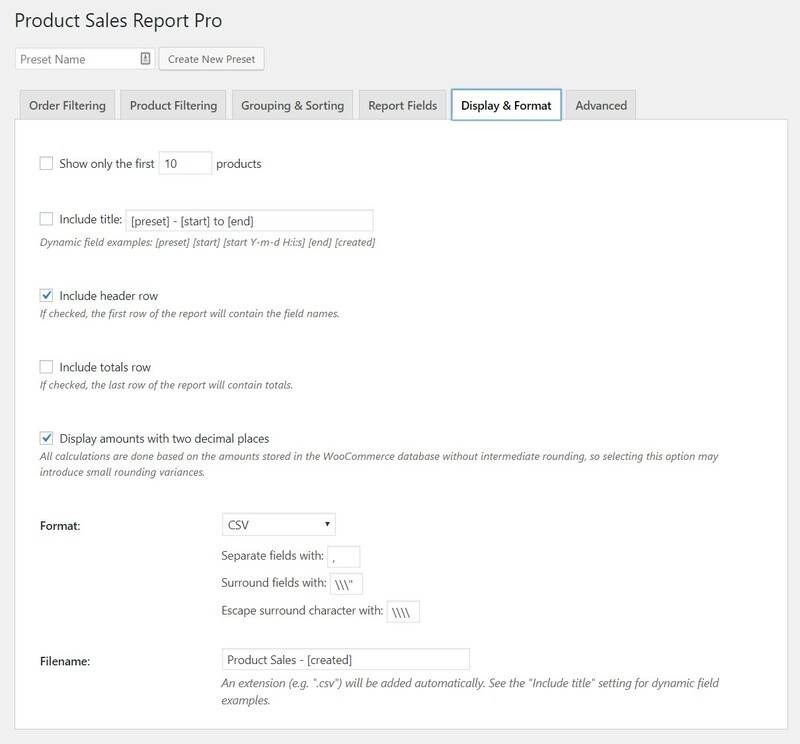 Generating Product Sales Reports. The plugin is now installed and ready for use. Please note that you must also have the WooCommerce plugin installed and activated in order for the Product Sales Report plugin to function. 1. 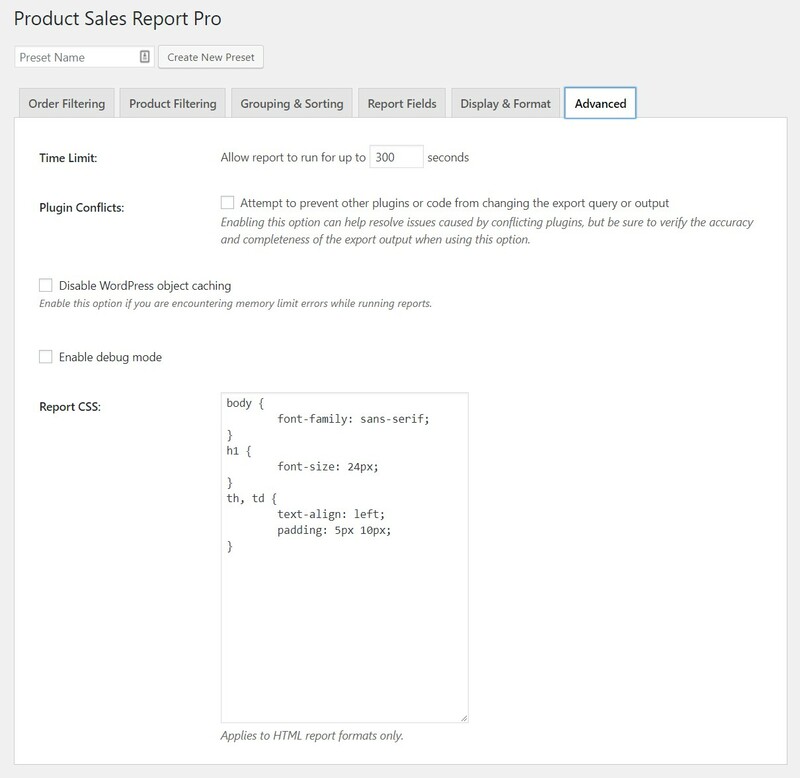 In your WordPress Admin, select “WooCommerce” > “Product Sales Report” from the left sidebar menu. Order Filtering◦ Order Period: The period of time to report on. The “Last 7 days” and “Last 30 days” options will report on sales made in the 7-day or 30-day period ending yesterday (today's sales are not included). The “Custom Date Range” option allows you to specify your own start and end dates and times for the report. Times must be entered in the format HH:MM:SS (with optional AM/PM), and the end time is exclusive (i.e. only orders placed prior to the specified end time are included). Do not specify the midnight hour as “00”; it should be specified as 12 AM. The “Custom Date Range” option includes a “dynamic date” feature that allows you to specify an expression such as “last Monday”, “-14 days”, or “yesterday”, which will be used to automatically calculate the report date relative to the date on which the report is run. To use this feature, click the “dynamic date” link and enter your expression in the text field that appears below the date field. If your expression is valid, the date field should automatically update to show the calculated date relative to the current date (based on the time zone set in WordPress). To disable the dynamic date feature for a date, click the “fixed date” link. For more information on expressions that you can use with this feature, see this page in the PHP manual. ◦ Include Orders With Status: Select which status(es) an order must have to be counted in the report. By default, only orders with “Processing”, “On Hold”, or “Completed” status are included. This excludes orders that are “Pending Payment”, “Cancelled”, “Refunded” or “Failed”. ◦ Only Orders With Field: If you enable this option and specify an order meta field and condition, only orders matching the specified condition will be counted in the report. For example, if you use a plugin that records delivery dates associated with orders, you can report on orders having a certain delivery date by choosing the delivery date field, selecting “equal to” as the condition, and entering the date in “YYYY-MM-DD” format (assuming that is the format that the plugin uses to store the date). You can use the “does not exist” option to only report on orders that do not have the selected meta field. ◦ Include Orders by Customer Role: Filter orders by the role assigned to the user that the customer is logged in as when placing the order, or choose to display only orders placed by guests (customers who are not logged in at the time of placing the order). ▪ To include all products in your store, select “ All products”. ▪ To only include products in one or more categories, select “ Products in categories” and check off the categories to include. ▪ To only include one or more individual product(s), select “Product ID(s)” and enter the ID number(s) of the product(s), separated with commas. 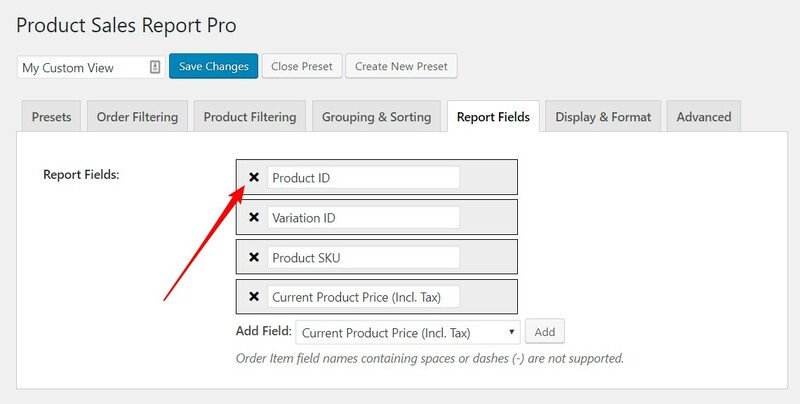 To determine the ID of a product, click “Products” in the left sidebar menu and hover over the product's title; the ID will be displayed below the title. 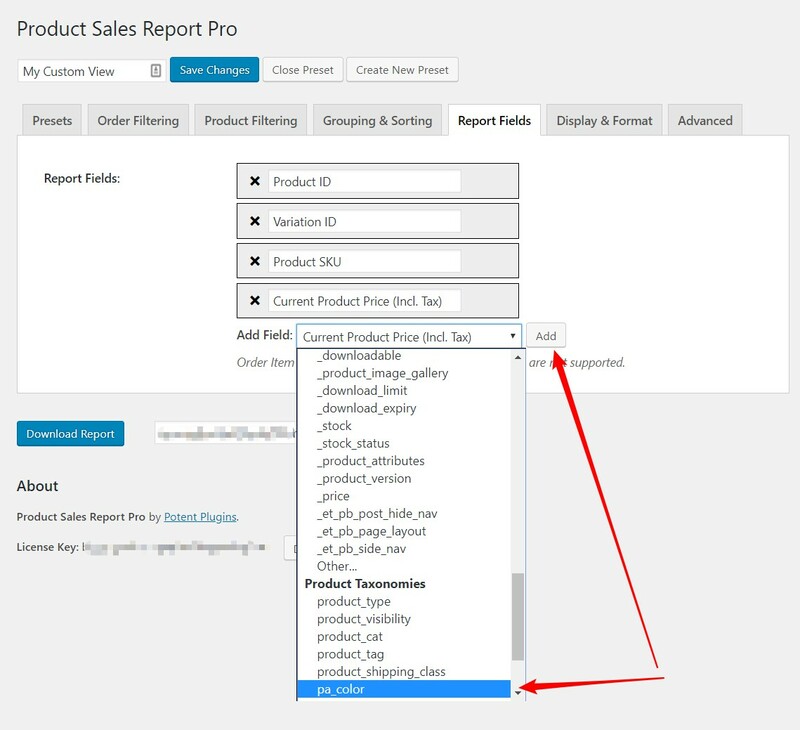 ◦ Only Products Tagged: If you enable this option and specify one or more product tag names (separated by commas), only products with at least one of the specified tags will be included in the report. You can add tags to the field directly or by using the drop-down below the field. ◦ Only Products With Field: If you enable this option and specify a product meta field and condition, only products matching the specified condition will be counted in the report. For variable products, only the parent product is filtered (not individual variations). ◦ Product Variations: Select “Group product variations together” to treat all variations of a product as the same product, or “Report on each variation separately” to treat each variation as a separate product. 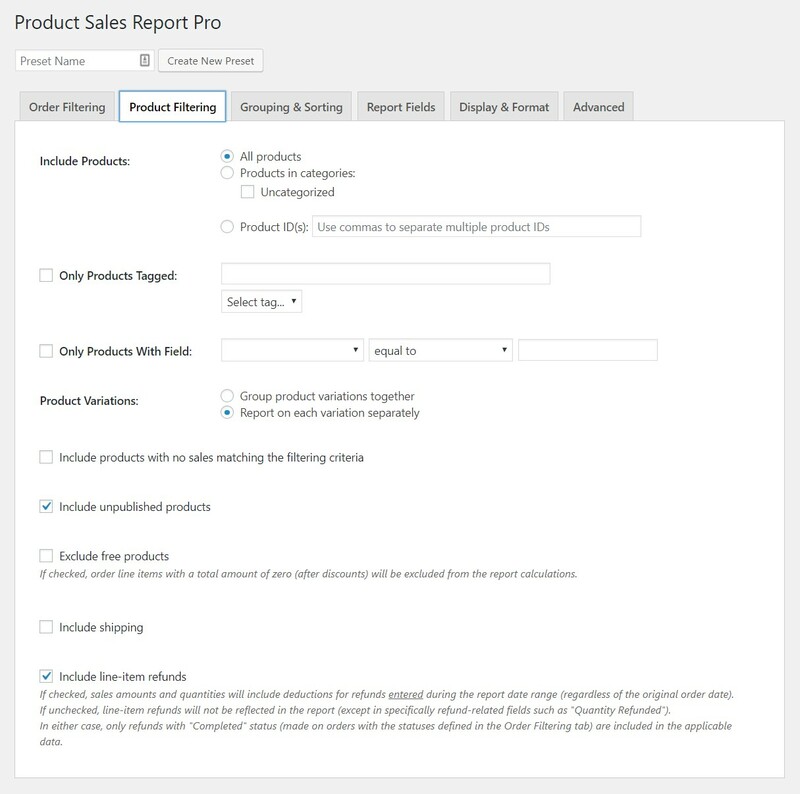 ◦ Include products with no sales matching the filtering criteria: Check this option if you want the report to list all products matching the product filtering criteria, including those with no sales matching the order filtering criteria during the report time period. 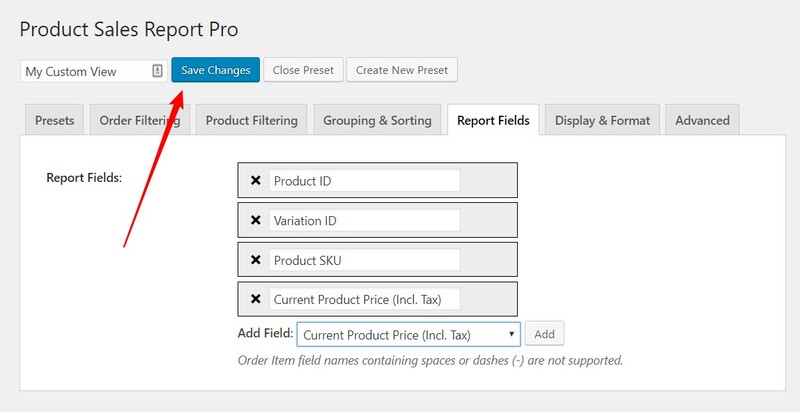 If product variations are reported on separately, all product variations with no sales matching the order filtering criteria will be listed as well. ◦ Include unpublished products: Check this option to include products with any post status, instead of only the statuses included by default for the current user. ◦ Exclude free products: Check this option if you want to exclude order line items with a total amount of zero (after discounts). ◦ Include shipping: Check this option if you would like to include shipping methods as products. For each shipping method used on at least one order that matches the specified date range and other filters, the report will include a row with the shipping method ID as the Product ID, the shipping method title as the Product Name, the number of times that the shipping method was used as the Quantity Sold, and the total shipping cost as the Gross Sales. Other fields will not be included. ◦ Include line-item refunds: If checked, sales amounts and quantities will include deductions for refunds entered during the report date range (regardless of the original order date). If unchecked, line-item refunds will not be reflected in the report (except in specifically refund-related fields such as “Quantity Refunded”). ◦ Group By: Choose an order field or order line item field by which to further subdivide the report in addition to Products and Product Variations (if applicable). 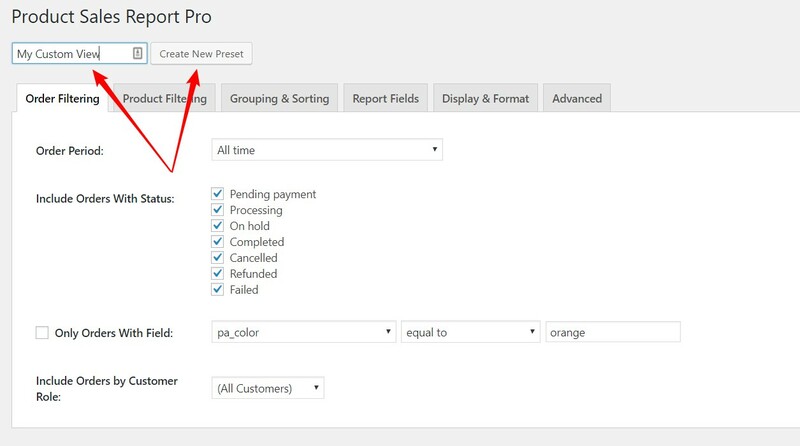 For example, choose the “_billing_email” order field to include a separate row in the report for each combination of Product/Variation and billing email. Do not choose a field that is already included in the report. The field you select will also appear in the report. You can change its name and position in the Report Fields tab. ◦ Sort By: Choose the order in which results are displayed in the report. 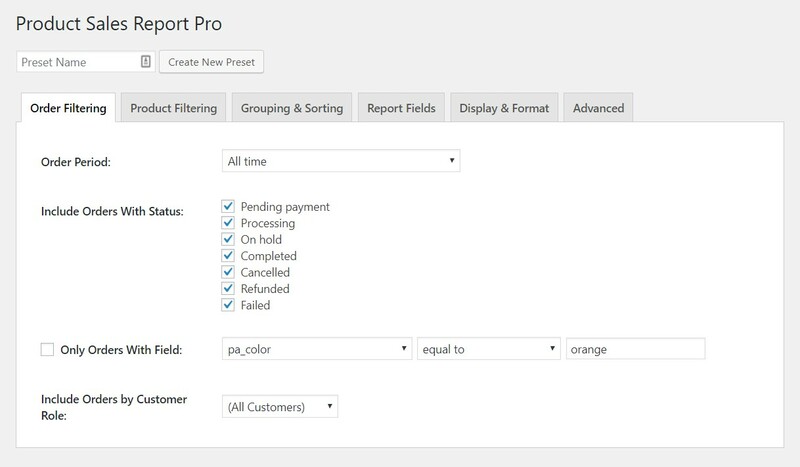 ▪ To add a field to the report, select the field in the Add Field dropdown and click the Add button. ▪ Uncheck the box next to a field name to remove that field from the report. The field will be removed when you save the preset, or (if not editing a preset) when you run the report and reload the report settings page. If you are using the Group By feature in the Grouping & Sorting tab, the Group By field will be added to the Report Fields list and cannot be removed. ▪ Drag-and-drop the fields to change their order. ▪ Edit a field name to change how it is displayed in the report header, if applicable. ◦ Show only the first ___ products: If you only want the first n results, select this option to help speed up the report generation. The date-based fields can optionally be followed by a parameter that specifies the date format; for example: [start Y-m-d]. This can also be used to display the time; for example [start Y-m-d H:i:s] or just [start H:i:s]. For more information on the date format specifier, see the “Parameters > format” section of this page in the PHP manual. ◦ Include header row: Uncheck this option if you do not want the field names included as the first row of the report. ◦ Include totals row: Check this option to include a row with totals of certain numeric fields at the end of the report. ◦ Display amounts with two decimal places: If checked, certain fields containing currency amounts will be rounded to two decimal places. ◦ Format: Select the file format of the downloaded or emailed report. ◦ Filename: Enter the name of the report file, without an extension. The filename can include a few dynamic fields. See the documentation for the “Include title” option (above) for more details. ◦ Time Limit: Modify the PHP execution time limit in effect when the report body is generated. Try increasing this value if you are getting PHP timeout errors. This setting may not have any effect on some servers. ◦ Disable WordPress object caching: Try enabling this option if you are encountering memory limit errors. ◦ Enable debug mode: Enable this option to display certain debugging information, such as the main SQL queries used to retrieve sales data. ◦ Report CSS: This field allows you to add to and modify the CSS styles applied to the “HTML” and “HTML (enhanced)” report formats. For security reasons, only users with the “edit_theme_options” capability are allowed to change this setting. 3. Click the Download Report button to generate and download the report, or enter an email address and click the Email Report button to send it as an email attachment. 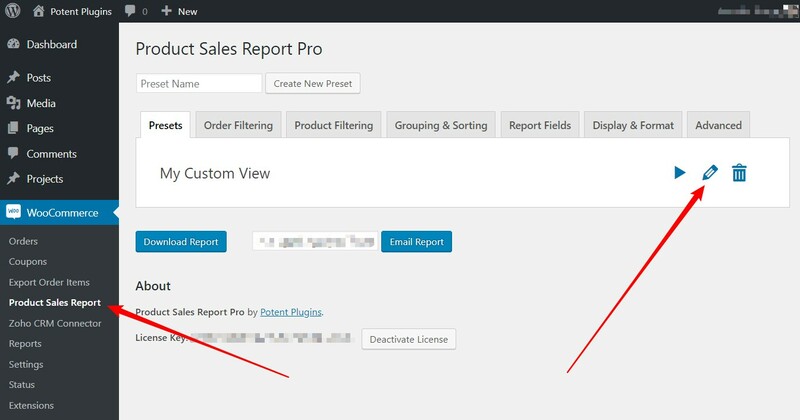 Once you have set up a Product Sales Report, you can save your report settings as a preset: simply enter a name for the preset in the field above the report settings tabs and click the “Create New Preset” button. The preset will then appear in the Presets tab. The Presets tab lists the presets which you have saved. You can generate a report based on a preset by clicking the “play” icon to the right of the preset. Clicking the “pencil” icon for a preset will load that preset's settings; you can modify the settings as desired, generate reports with the modified settings, and save the modified settings to the original preset (via the “Save Changes” button above the report tabs) or to a new preset (via the “Create New Preset” button; you'll probably want to edit the name as well). To rename a preset, edit the preset name in the field above the report settings tabs and click “Save Changes”. You can delete a report preset by clicking the corresponding “trash” icon in the list on the Presets tab. First you need to create a new Preset. After the preset is created you need to reload the plugin by clicking on its name and then click on the Edit button. You need to go now to configure the plugin tabs as explained in this document and then proceed to the Report Fields Tab. Then you need to add the custom fields or attributes that you consider important. You can add your own custom attributes too. Click on Add. Now that you have your custom view ready, click on Save Changes and go back to Presets. Now that your preset is complete, by clicking on Play or Download Report button you will be able to download it. You'll see that all the other variables are gone and only the ones you setup are visible. This plugin is licensed under the GNU General Public License version 3 or later (available at https://www.gnu.org/licenses/gpl-3.0.en.html).